Buying a fish is harder than having a baby | What's a daddy for? It was my son who started it all by telling us there was something missing in his life. ‘Mummy and daddy, I’d like a little brother or sister. Or else a goldfish’, he declared as we readied him for bed last night. We were queuing outside the pet shop before opening time this morning. It seemed a simple enough task. Buy a couple of fish, a cheap tank, maybe a toy treasure chest. Done and dusted and back home in time to make Sunday lunch. Mummy insisted on accompanying us. She knows what I’m like with salespeople. Left to my own devices and she’d most likely have been returning home to find I’d agreed to have our home transformed into a giant indoor tropical aquarium complete with sharks and killer whales. We decided she should lead the delegation. The fish shop had no natural light but an abundance of artificial coloured strobes, giving it the feeling of a really chilled out nightclub. A large and serious man attended to us. We told him he wanted fish. ‘What sort of tank were you thinking of?’ he enquired. ‘Just whichever one is cheapest.’ I answered brightly. I took a step back, fearing I had said the wrong thing. He showed us a few tanks. I’ve slept in smaller bedrooms. I pointed out a small one in a different aisle, a tank which was a quarter of the price of the ones he recommended. It had Dory out of the Disney film on the box. It seemed kid friendly. His frown reached a new depth. We assured him we would take that risk. But his true objection had not yet revealed itself. This confused me a little. I was pretty certain that even my four-year-old wasn’t expecting that the real live Dory would be in the box. I wasn’t sure quite what would have satisfied the sales assistant’s thirst for authenticity with this product. Maybe he would have only been appeased if the ghost of Walt Disney himself had been trapped in the tank. Eventually we persuaded him to allow us to buy it. We were making progress. ‘Just a couple of goldfish would be fine,’ I responded. It was impossible for him to frown any deeper. So he began to shake his head instead. Then he said something which completely astonished me. My head began to spin. Everything I knew as certain in this world was now at risk. Black was now white. Illegal to buy a goldfish? Peppa Pig has a goldfish in a tank. It’s called Goldie. Was I now being told that Peppa is nothing better than a common criminal? That sounds fine, I was about to say, before my wife sharply nudged me. She’s got that wonderful instinctive ability to know I’m about to say something stupid. It takes years of suffering to hone that talent. But fishman was warming to his task. He looked at me solemnly. ‘Ha!’ He exclaimed, smiling for the first time today. Perhaps for the first time ever. This was a good point. Although he seemed to have overlooked the trauma of having a fish which was likely to live longer than me. Buying a goldfish had definitely become a lot more complicated since I was a kid. Back then you went to the Lammas Fair and brought home a couple of them in a plastic bag, no questions asked. And they were fine. Well they were fine for five or six weeks. I have a hazy memory of keeping a goldfish in the toilet while we bought a proper bowl. But again this may be my mind playing tricks on me. So we weren’t buying a goldfish today. Ok, move on. A fish is a fish. But the hits (and the added cost) just kept coming. It turned out we first needed an electric water filter (? ), water conditioner (??) and bio-boost (???). Ok, ok. Can we please now have a fish!? Well, as it turns out, no. Our new friend explained to us that he couldn’t allow us to take a fish home today. We had to set up our tank, treat our water for a week and have it tested first. I looked around to see if Jeremy Beadle was hiding in a tank nearby, trying to launch an unlikely comeback. My son had his little blond head buried in mummy’s shoulder. I was now reversing my whole position. It actually would be easier to have another child than do this. I certainly didn’t have to pass any water tests before I became a daddy. Perhaps fishman saw how demoralised we had become because his face softened a little. He said: ‘I don’t want to hurt your feelings but my first concern is for the happiness of the fish’. (I swear I’m not making this up). My feelings were a little hurt. But I didn’t let on. 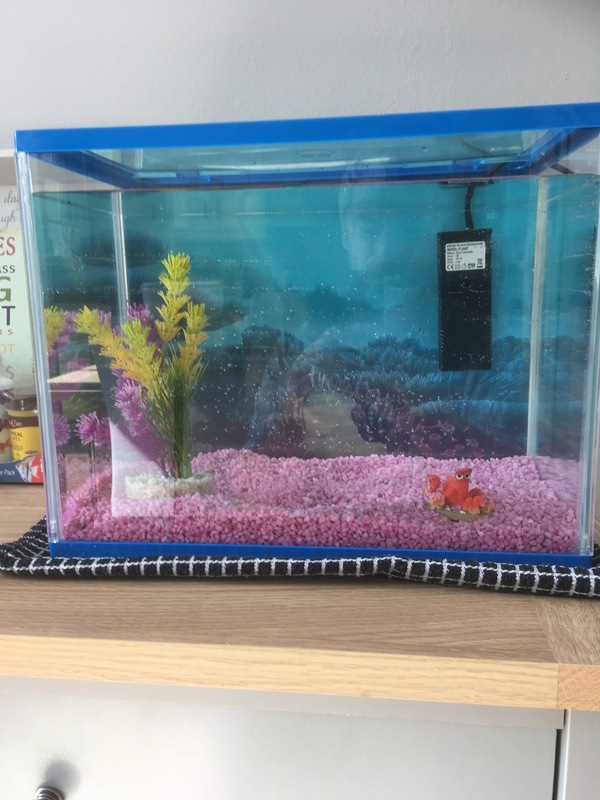 And so we trudged home with an empty tank, bright pink stones, a little toy octopus, a filter, food, conditioner, bio-boost….but no fish. I imagine by the time we get round to having our water tested next week my son will have forgotten all about it and have decided he wants something else. Like a tattoo. And if I fail the test I will feel like my ability to be a responsible adult has been invalidated. And if I pass then I’m lumbered with a fish I don’t really want for the next 40 years. There’s no good option. If only I’d taken the easy path and had another child. Hahahaha!! This is fantastic!!!! Highlights – “Everything I knew as certain in this world was now at risk” and possible Jeremy Beadle hiding in a fish tank! I was laughing the whole way through, starting with the rapidity of you and your wifes’ arrival at the pet shop!!!!! 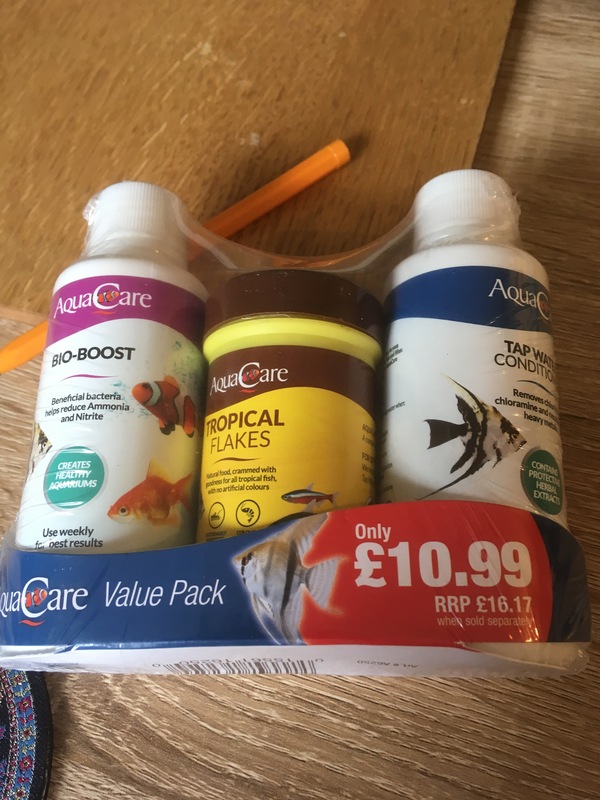 Our eldest actually went through a phase of wanting a “goldfish” and I did some research and discovered that fish are much harder work than Peppa Pig and the Lammas Fair would have us believe! You my friend need to involve Google in more of your big life decisions! Haha!! Oh no. I am acquainted with this fish man but we actually went about it all the wrong way and I’m not in his good books. I aquired a gold fish when my kids visited the lammas fair. No joke. You can imagine his face when I revealed this nuggest of information when I went to buy them a bowl. Oh my, it was like I had come out with a string of swear words when I mentioned a goldfish bowl. They are cruel apparently. So I got the same supplies you’ve got today, followed all the instructions for adding the stuff on alternate days etc, got my water tested, he gave me the thumbs up and I transferred the fish. The bloody thing died after 2 days. Kids were upset, so we fessed up to killing the fish to the big guy in the shop. Asked for advice all over again. He convinced me to try tropical fish and sold me an immersion heater for the tank. Another week later we got some tetras. They were boring, didn’t move. So we got some other wee small orange ones (danios?). Whole thing lasted about 8 weeks then they all died one by one. I couldn’t go back to the big guy. The tank and equipment (about £100 worth) are in my garden shed. I’m no good at fish. I’m intrigued – are you planning to follow through and go back for the (non-)goldfish?? We’ll be back this weekend. Watch this space…..
Pingback: Mummy drinks the fish water | What's a daddy for?